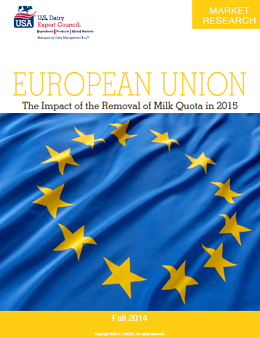 European Union (EU) milk production quotas end March 31. The change will drive output of all dairy product categories to some degree, as EU farmers and processors seek to capitalize on emerging market demand—pursuing many of the same countries U.S. exporters are targeting. A study you can request from the U.S. Dairy Export Council (USDEC) examines the likely impact of quota removal by analyzing the six EU nations with the greatest post-quota growth potential: Denmark, France, Germany, Ireland, the Netherlands and Poland. Through 2020, those six will account for the vast majority of EU dairy production growth and export expansion. The USDEC analysis determined that, under the most likely scenario, the six would increase annual milk output by nearly 26 billion lbs. from 2013-2020. The study further concluded that although a bigger European export presence would create greater competitive challenges for U.S. suppliers, continued rising emerging market demand would absorb increased EU volumes and still leave ample opportunity for U.S. suppliers in nearly all sectors. We can gather some clues on the EU’s initial export strategy from supplier investments over the past couple years. The study identified about $2.8 billion spent on new processing facilities completed or to be commissioned in the near future—with a clear focus on powder. About one-third of the money went toward non-commodity infant formula and another third toward commodity milk powder. The USDEC study forecasts the six target nations will lift whole and skim milk powder production by a combined 750 million lbs. from 2013-2020. Nearly 85 percent of that combined total, around 631 million lbs. per year, will find its way to export markets, primarily in developing countries in the Middle East, Africa and Asia. Cheese and butter have received very little capital investment at this point. In the case of cheese, that doesn’t mean we won’t see increased production. Annual cheese output in fact will rise more than any other product category by 2020—by nearly 1.5 billion lbs. Internal consumption will eat up about 1.1 billion lbs., but EU suppliers will ship around 360 million lbs. to world markets. However, despite the anticipation and preparation, the idea that the EU will swamp the market is erroneous. While some EU companies are already geared to export, others are starting from a lower level of knowledge, service and capabilities. Just as U.S. suppliers have done, EU exporters will need to make significant investments in personnel, infrastructure and innovation to maximize foreign market potential. Such strategies may not come naturally to some of the traditionally EU-focused co-ops. EU milk producers and processors also face more restrictive environmental regulations than their U.S. counterparts, and they lag in developing tools like dairy futures markets to mitigate volatility. The EU’s own growth estimates vary widely and tend to the conservative side. The bloc originally forecast growth of about 17 billion lbs. of milk from all 28 members from 2013 to 2020. Now that EU suppliers are on pace to boost output by more than 11 billion lbs. this year alone, the bloc raised its projection to 26.9 billion lbs. by 2020—just slightly higher than USDEC’s six-country forecast. USDEC’s most likely scenario too is a midline: EU growth may exceed or fall short based on a number of variables, the primary one being farmer confidence. Farmer confidence has eroded steadily throughout 2014 in concert with international commodity price declines. Respondents to USDEC’s interviews claimed they would seek continued rises in output and ignore the fundamental cyclical nature of the dairy supply chain in the firm belief that continuing Asian demand would keep prices around the levels seen in the first half of 2014. But, just a few months later, many EU farm groups were growing increasingly vocal in their demands for market support, ramping up protests and even calling for maintaining quotas. While milk production costs will ultimately determine the region’s response, under most imaginable post-quota scenarios, competition to supply rising dairy demand in emerging markets will intensify as EU exportable supplies grow. If U.S. suppliers continue to develop core competencies such as meeting tight product specifications, providing technical and customer support, and improving supply chain management, they can expect to continue their evolution as global players and defend and grow their export business.